. (1389). جستاری در تعامل عقل و دین. عقل و دین, 2(1), 107-138.
. "جستاری در تعامل عقل و دین". عقل و دین, 2, 1, 1389, 107-138.
. (1389). 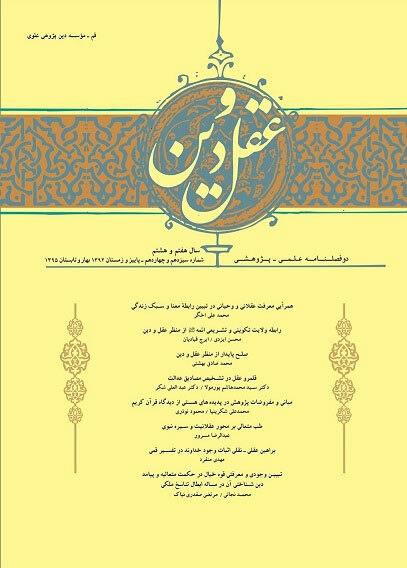 'جستاری در تعامل عقل و دین', عقل و دین, 2(1), pp. 107-138.
. جستاری در تعامل عقل و دین. عقل و دین, 1389; 2(1): 107-138. *. عضو هیئت علمی دانشگاه پیام نور، واحد شهریار www.zkheirolahi@yahoo.com. Zahra Kheirollahi* This writing wants to express vital methods of the religion and its role in social and individual fate of human; and so studies and analyzes sensitive mechanism of reason in the realm of religion. In the one part, analyses pathology of reason and religion and in another part, studies compact relation of them. So, argues about essential authority of reason and revelation, and religious and hearty obligation introduces as the most valuable motive for morality and human duties. The prophets' method, against the extremist tendencies, isn't antagonist of reason, but on the one hand, it's ultra reason and on the other hand, it's complementary of reason and coordinated with genesis of humans. Also in the end of article, attempts that removes tension between two approaches of rationalism and religious legalism, and reveals possibility of proximity of them. *. Payam-eNoorUniversity, Shahriar, Iran ; www.zkheirolahi@yahoo.com.